Several years ago I would use Wordpress to create the content, and wouldn’t care so much about low-level stuff. After all, I was focused on doing .NET and Java applications development, and didn’t care much about the web. Nobody read my blog, and scalability or performance were topics that felt far. I write my posts on my personal blog using Markdown. The blog uses Hexo behind the scenes, but this isn’t really important. Most static site generators support Markdown these days. Posts and pages are exported to a static HTML pages. As a bonus, an AMP version is also generated. I use a hexo generator that does the heavy lifting to create an AMP-compatible version. After publishing it, I import the post on Medium. Imported stories include a canonical URL pointing to the original post on my blog. This is important so search engines don’t see it as duplicated content. In other words, this is good for SEO. This workflow seems a good compromise to me. First, I want to keep my blog as the canonical place where users will find the content. All publishing platforms I have used are still up and running today, so this is not the issue. I like keeping a link back to my site, where I have full control of what is delivered, and visitors can know more about me and my projects. 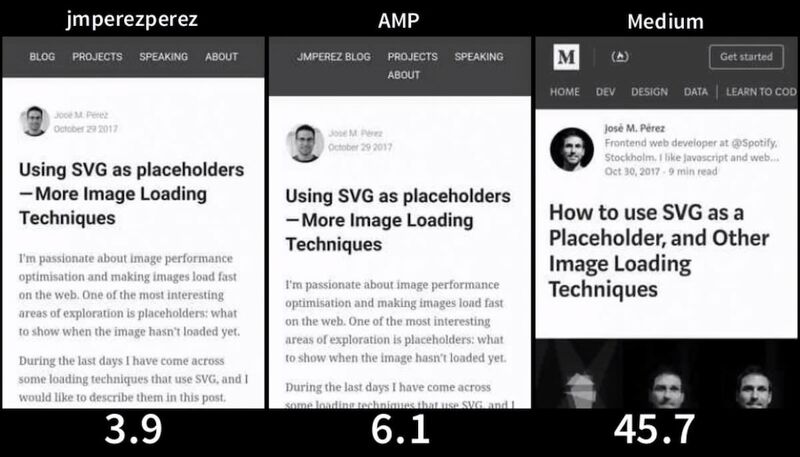 Second, I think AMP can be good for users to identify content that loads fast (more on this later). I have been following closely some runts about the AMP format. I’m not a big fan of it, and I would prefer that Google displayed somehow that a page result is fast enough, without having to be an AMP page. Third, I don’t want to miss the network effect of a platform like Medium. Until recently, very few visitors would access my site. When Google is your main source you need to rank very well. I know enough about SEO to firmly belief that the best tip is to create useful content. 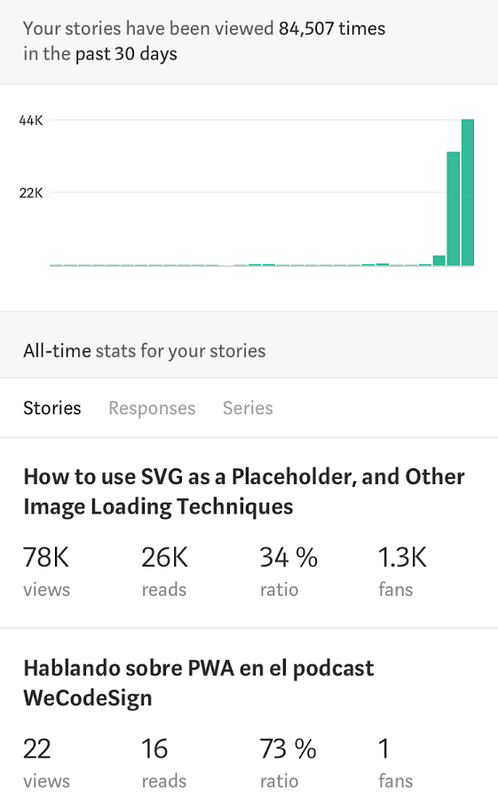 Medium posts look beautiful with very little effort. More importantly, Medium has a great network effect. It makes it easy for people to follow editors (at least easier than having to subscribe to a RSS feed using some external app or web) and the content can be showcased through tags. I definitely think that using Medium has been key to get a higher exposure. Medium also has publications where you can submit your stories. An example is Free Code Camp and Hacker Noon. They can give you feedback to improve your post, and will also do minor editings to make it more compelling. A screenshot of my posts stats a little after I published that SVG post. I’m not trying to get as many visits as possible for the sake of it. I have received lots of interesting comments about my posts on Twitter and Medium. And these posts have opened me the doors to speak at conferences, give interviews and write guest posts. And I hope my posts have inspired and helped other developers, the same way their contributions have shaped my knowledge. As a web developer who likes to talk about Web Performance Optimization, I can’t help keeping an eye on the platforms where I’m posting my content. It doesn’t need it, folks. It’s a static blog page. In my defense I will say I have little control on Medium.com’s web performance. Also, Medium’s strong point is not performance, as I’ll show in a moment. I said earlier that I’m not a big fan of AMP. It is marketed as a project that “enables the creation of websites and ads that are consistently fast, beautiful and high-performing across devices and distribution platforms”. WebPageTest run of the same post on 3 different formats/platforms. Of course, if you are a performance geek you can make things faster. Just keep in mind that AMP is not a silver bullet. If you want to read more about AMP I recommend you to check out Chris Coyier’s “Need to Catch Up on the AMP Debate?”. As with everything in this life, every platform has its pros and cons. Hopefully my workflow can help you getting a more informed decision on where you publish your content.